FORT LAUDERDALE, Fla. -- My old Palm Beach Post teammate, Edgar Thompson, had the chance to speak with legendary Miami Dolphins coach Don Shula at a charity event Wednesday night. Thompson asked Shula for a reaction to outside linebacker Joey Porter's recent railings against the team. "The Joey Porter thing, I think that's just outrageous with him coming out like that," Shula said after receiving a philanthropic award from the Moffitt Cancer Center. "He obviously wants out. I'm sure he'll be accommodated." Shula contended Porter could have achieved the same conclusion in a more respectful manner. Instead, Porter tore into the team in interviews this week on "Jim Rome Is Burning" and on Miami sports radio station WQAM. "That could have been done with him going in and visiting the Dolphin decision-making people and doing it quietly," Shula said. "But he decided to do it the other way." Wonder how long Shula would have put up with this kind of behavior? What does class have to do with it? I am Joey Porter. I speaks my mind. Thou shalt not criticize The Don unless thee wants to incur the wrath of Big Dave. Agreed. However Porter is doing this because he knows he is on his way out and he needs to let other teams know the reasons (EXCUSES) for his lack of production last year. The guy is trying to find a job next year and he's going around blaming the Dolphins for his lack of production. You have to respect it from a strategic point of view. The person who is really bordering on the outrageous is Channing Crowder. The guy is coming off of a terrible year statistically at a critical position,knowing that the Dolphins were very willing to let him walk last year, and he comes out and plays Porter's sidekick on this whole thing. Talk about IDIOTIC. So let it be written---So let it be done. but seriously, has Shula ever been questioned on this site? Why would anyone want to question the BEST coach ever. I've been posting since 06 I think and I've never seen it. Wonder if a guy would get banned. 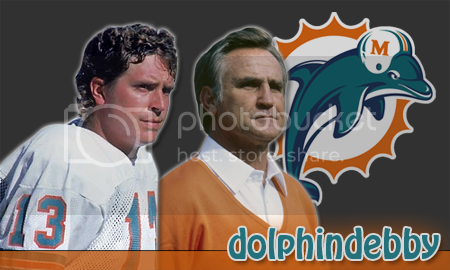 I am big Shula fan, I even find it blasphemy for someone to say they like any of the Ryans, when Shula had an obvious distaste for Buddy Ryan and his big mouth. There has only been one time that I was annoyed with what Shula did, but I would not dare speak those disturbances out loud. I'll just bury it deep down inside and never bring it up.